It would be easy to assume that, after 50 years as Britain’s best-selling van, we had written just about everything there was to write about this iconic vehicle. But until now we had yet to get behind the wheel of the new Jumbo Transit, the titan on test here. It’s the biggest variant in the range and is firmly aimed at fleets which need some seriously heavy-duty transport. The Transit was launched in its current format in 2014 and since then has been winning even more fleet friends with its extra robustness and smooth on-road manners compared to the old model. Ford’s sales figures have been on a roll since then and presently the blue oval’s tally is 27% up on last year. 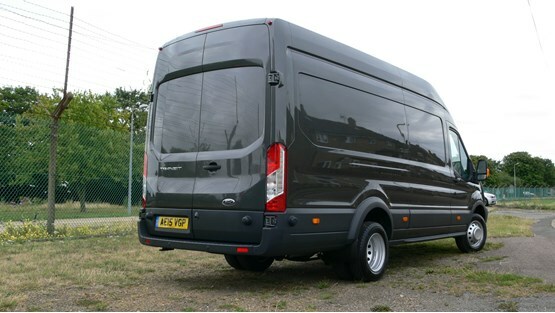 It must be said that the Transit isn’t the best-looking heavy panel van around at present – its outer appearance is very much geared to the American market where it is now being sold for the first time – but assuming that looks are about bottom of the list of priorities for most fleet buyers, this is an irrelevance. Despite its size, it just nudges under the magic 3.5-tonnes gross vehicle weight, which means that fleets don’t need a tachograph and O-licence to use it, yet it still offers a reasonable payload of 1,195kg. Having said that, any heavyish cargo will take this model to its maximum weight limit in no time and care will have to be taken to avoid accidental overloading. We’d recommend the fitment of one of the bolt-on weight warning devices such as VanWeigh as a must-have addition. Of course, many fleets carry bulky but light cargo and for them the Jumbo Transit makes an ideal choice. The van is powered by a 2.2-litre unit offering 155bhp and 284lb/ft of torque, which translates into plenty of pulling power, even with a full load on board. Power is transmitted via the rear wheels and the Transit also sits on twin rear wheels, adding to the heavy-duty appeal of this van. 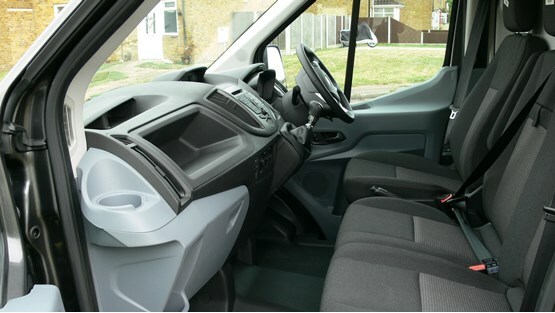 Outside, the Transit is liberally swathed in plastic panels to minimise damage to the paintwork while in use and the huge rear doors open to reveal a cargo area in which six-footers can stand up without bending. Thanks to the presence of a propshaft underneath, it’s a big step up in to the cargo area – 66cm to be precise – but once inside, the Transit looks cavernous. There are 12 load-lashing eyes but they are all sited in the floor, unlike some of the opposition which have useful extra lugs halfway up. On the plus side, though, there are no fewer than five lights in the cargo area, which will be a boon for anyone making night-time deliveries. The most surprising and pleasant thing about this van is that, despite the general bulk, its road manners are almost car-like. The engine is smooth and quiet and handling is precise, with a tightish turning circle. Once on the road, it’s easy to forget that this vehicle is not far short of seven metres long. Gear changes are slick and smooth and the power steering is weighted to perfection. A fuel economy figure of just over 35mpg on the combined cycle is pretty fair too for a van of this size.